In my neighbor’s garden there is an old apple tree. The tree and the garden is in need of care. It always hurts my heart when I see fruit of any kind fall to the ground before anyone even thinks of taking care of them. As nobody actually lives next door I think its ok to pick them. So I went over there to have a look. The apples didn’t look that great and they would probably be terrible in most things, I thought. I took a bite and smiled. It was a crisp bite and the taste was sweet and sour at the same time. This abandoned tree was in fact a Granny Smith or at least something very close to it. Granny Smith may not be my absolute favorite but an apple like this is excellent in an apple tart or a nutty manchego salad. Apples in general are very useful in cooking, for both savory or sweet dishes. A chicken for example is really flavorful when roasted whole filled with apples and prunes. Different kinds of preserves such as apple compote, apple butter and apple chutney are fantastic treats that can be served with many different things, such as a sweet flavor in oatmeal, as a side to meat or together with cheese on bread. While growing up I remember having only apple compote with cold milk as an afternoon snack. Then there are endless amazing cakes and pies that can be baked with apples. There is of course always the classic Tarte Tartine that was created by two sisters after a successful accident in the kitchen. A more unusual apple pie is the south Swedish version (Skånsk Äpplekaka) that is made with rye bread crumbs. It may sound strange but its absolutely delicious served with vanilla sauce. If you have a lots of apples you should really consider making your own apple juice or cider. If my neighbor’s tree would give me more apples, I would definitively brew hard apple cider. Sandor Ellix Katz says, in his book “wild fermentation”, to brew apple cider is one of the simplest alcohol fermentation you can make. 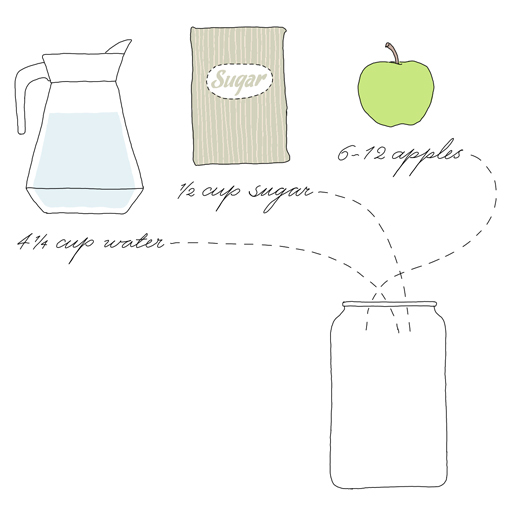 You just need fresh good quality apple juice (preferably juiced by yourself), a jug, a cheese cloth and a rubber band. He calls it Spontaneous Cider. Last year I got really inspired by Joanna at Zeb Bakes when she made apple cider vinegar with the scraps and pieces that were left over after making apple cake. I think it’s really clever to use something that normally would be thrown away. 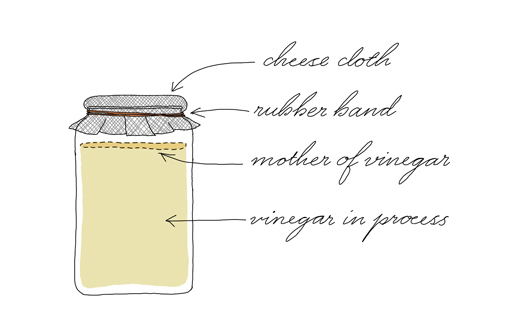 Joanna’s vinegar was inspired by Carl Legge‘s experiments which he describes very well in his post Fermenting Revolution 2 – Apple cider vinegar. 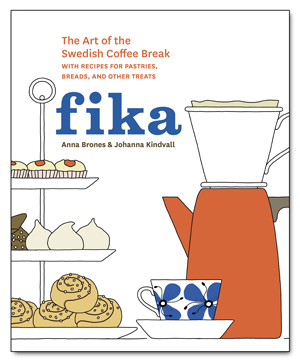 The below recipe is pretty much the same as Carl’s formula (Sandor Katz suggests less sugar in his book). I think my neighbor’s Granny Smith are perfect for this recipe. Heat up the water together with the sugar. When the sugar has dissolved into the water take off the heat and let cool. This is important as hot liquid will not let the natural yeast start the process. During this time you can prepare the apples. I used whole apples, which I rinsed and cut into one inch (2-3 cm) pieces. But you can use leftover bits and pieces as well. 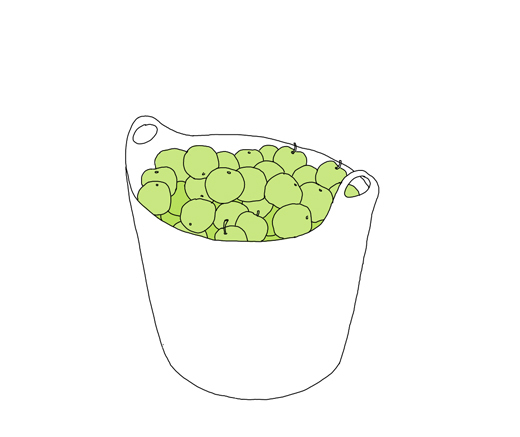 Place the apples in a large glass jar or other suitable container. It’s good if the jar has a wide opening, according to Sandor Katz a larger exposure to air helps the process. When the sugar solution is cool enough (about room temperature) pour it over the apple pieces. Place a plate on top to weigh down the apples (I took a bowl and a mortar). Place the container in a warm place. To avoid flies etc cover with a cheesecloth or kitchen towel (fastened by a rubber band). Stir and taste the apples every day. (After about 3 days I could see small bubbles and the flavor was sweet and fizzy. This as a good sign, the fermenting process is doing what it should do). After 7-10 days, the apples have done their job and you will need to strain them through a sieve. Pour back into the jar and let stand for another 7-14 days. Continue to taste your batch regularly. It will soon start to taste more like vinegar than cider. When you are happy with the flavor, strain the liquid again and pour the liquid into sterilized bottles and seal them properly. The film that will be created on top is called “Mother of Vinegar” that can be used as a starter for your next vinegar. * You can of course use any other kind of apple in this recipe. You can also make vinegar with other kinds of fruit and berries. Sandor Katz mentions in his book that almost any fruit scraps and peels etc can be used for making vinegar. He suggests pineapple, grapes or even overripe bananas. This article was originally published at EcoSalon, 2 October 2012. In this Autumn Foraging series see also Autumn Foraging: Rose Hips with a recipe of Rose Hip Sherry.